Spatial organization conveys a powerful influence upon the way we live in our gardens. relationship that serves your most important requirements. The perception of space in our gardens is also shaped by the way humans perceive the world. We perceive the world though a maze of memories, impressions and emotions. These collected experiences shape our responses. If you don’t believe me take a look at the following two pictures! In the first picture you see a 3 dimensional object, a globe. In the second picture, you see how that “object” really looks in two dimensional space. Also notice two other things. First, note the size of the artist on the "top" of the globe. Now look at the size of the people beside him. They are the same size. The globe appears very large, so the artist appears very small. This is an optical illusion which tricks the eyes, at ground level and in the right position, into believing they see a three dimensional object when the “object” is really two dimensional. This is an example of how our emotional and visual perceptions alter our sense of spatial organization. We process information visually through our experiences and expectations. We use contextual cues such as shadow, overlapping, relative size, orientation, elevation, textures, and colors as visual cues that help us interpret our 3 dimensional world through our 2 dimensional vision. We literally calculate mathematically the depth, width and height that make up our perceptions of three dimensions in space. In other words, our depth perception is entirely dependent upon these contextual clues. Our perception of spatial organization is changed by the contextual cues present. So how does this apply to our question of garden design? Gardens are part of our three dimensional world. We “see” the two dimensional objects around us as three dimensional. For more about how we see, you can visit this page on visual perception. 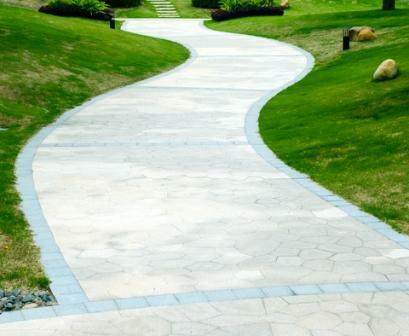 Therefore, the contextual cues we use to perceive our world are highly applicable in garden design. 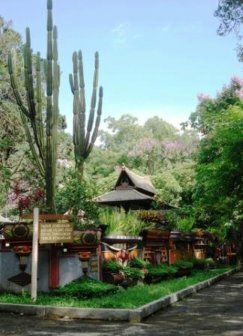 Let’s take a look at the following set of photographs to get a sense of how these principles can be manipulated in order to trick the eye into drawing conclusions about our garden spaces. First, let’s examine two dimensional and three dimensional space by comparing a landscape plan to an actual photograph of a garden. When we look at this plan, we see several interesting characteristics. Notice first that there are paths that wind throughout this garden. 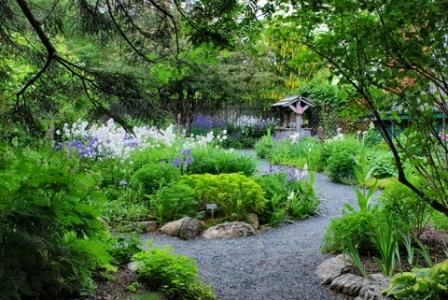 Plants hug the edges of this path, and a gazebo is nestled into the garden. 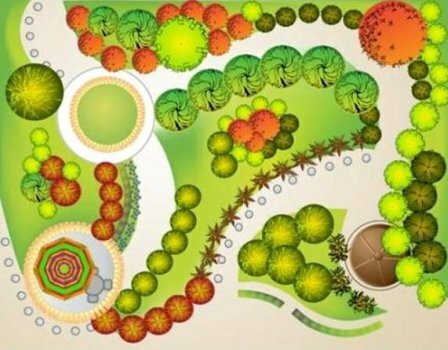 This is a two dimensional picture of a concept of organization for the garden space. It leaves us with a very ordered impression, everything in its place, everything reasonably flat in our vision, in spite of the artists attempt to create the illusion of three dimensions. The garden below is not the same garden. However, it is closely enough related in design to illustrate the point that in 2 dimensions, a garden may appear very differently than it does in three dimensions. Here we see the same sort of winding paths, plants hugging the edges, and a wishing well nestled in the garden. Essentially these are the same elements. Yet the impression we have emotionally is very different. We want to walk into this garden. It is an emotional and physical experience, even in a photo, that is entirely lacking in any two dimensional representation. So we see here that there is a human dynamic that cannot be replicated in a drawing that is present in our three dimensional view of the world. More importantly, our perception of space is altered. This next set of photos will help us see another principle of spatial organization. We all grow up in a world that is much larger than we are. We learn, unconsciously, over our first several years of life that our world is organized very consistently. There is always a foreground, middle ground, and background to any picture we form of the natural world. These are called spatial planes. To illustrate this principle, take a close look at this photo. Due to the simplicity of this photo, it is very easy to see the three spatial planes we are discussing. 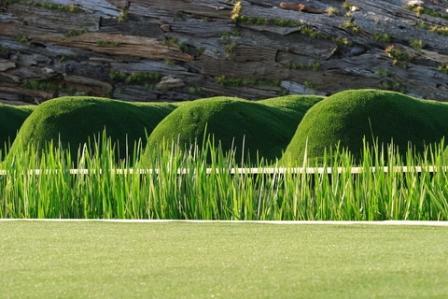 In the foreground, we see a level and neatly manicured span of grass, edged by a planting of cattails. This is the plane upon which we live. Just behind the cattails, there are hillocks in a very ordered progression across the entire photo. These deep green mounds are in the middle ground of this space. Behind this middle ground, we see a wall of rock. This rock forms the background of our mental photograph. This visual principle is in effect every moment of our day. We see a foreground, middle ground and background in every view of nature. Let’s translate this now into another picture where the three planes are not quite as clearly laid out. In this photo you may not see the three planes quite as clearly, but they are very present. This view is much more enclosed, so the “distant background” we saw in the preceding photo is not as clearly seen here. Notice though that this view of a space still very much follows this principle of spatial organization. There is a foreground, seen in the ferns at the base of the photograph, as well as in the brick pillar at the right. The middle ground is furnished by the brick wall itself, which stretches throughout the middle of the picture. The background is seen only through the arched doorway at the back of the photograph. Our three planes are furnished even in this more confined space. Another spatial organization principle that is of value to observe is the principle of atmospheric perspective. This principle states that as objects get farther away they appear smaller and they become less distinct. This spatial organization effect is clearly seen in the photograph here. 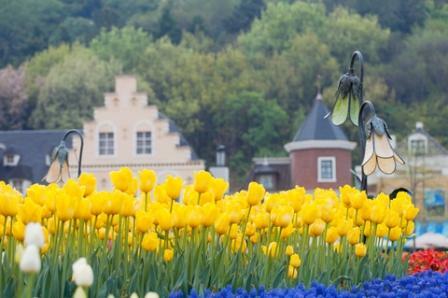 In vivid color at the forefront of the picture are a planting of charming yellow tulips set against a deep blue planting of hyacinth, and another splash of red tulip. All of these plantings are very clear and distinct. In the middle distance we see a couple of homes. These are less distinct, and the colors of these tones are slightly greyer, less vivid, and quite small in relative size to the tulips at the forefront. We know from our personal experiences that houses are much bigger than tulips! Lastly, in the distance we see a very indistinct, almost hazy view of the hills behind the homes. Again, these colors are more grey and indistinct than those even in the middle ground. In this photo, these effects have been heightened by the angle of the camera and by exposure techniques, but these principles are very much a part of our everyday experience. Walk outside and take a look, and once you actually pay attention, you’ll be amazed that you have missed that all these years! In the next photo of a garden more enclosed by trees, you will easily see the same effect. In a progressive fashion, from front to back of the view, you see a gradual graying of the color palettes and less distinct lines of division between the elements. Another principle of spatial organization that is useful to understand when designing a garden is linear perspective. Linear Perspective is a mathematical principle that is applied to objects and vistas which essentially states that when viewing an object or set of objects, that lines converging toward a single point in the horizon will eventually meet, and that objects along its length may be the same size but appear to be progressively smaller. This is most easily illustrated using two sets of converging lines, such as those in a garden path. In this example, the curved lines are equal distance apart all along the length of the garden path, but to our vision, from a position looking along its full distance, the lines appear to converge, making the visual effect appear to diminish in size along the length of the path. This is one example of linear perspective. Linear perspective is an important spatial organization technique that is extremely useful in creating a sense of motion or of tension in a landscape. An exciting variation on the spatial organization technique of linear perspective is what is called forced perspective. This principle is extremely useful in the garden for creating illusions. 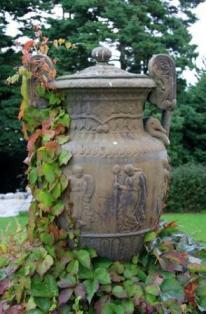 Another example of using forced perspective can be seen in this photo of a garden urn. In this photo, a very large urn is placed at the forefront of the scene, which causes the larger trees in the back to diminish visually in size, and creates an illusion of space. This technique is particularly useful in smaller garden spaces. This page has focused heavily on understanding the basic principles that can be used to organize space in your garden. 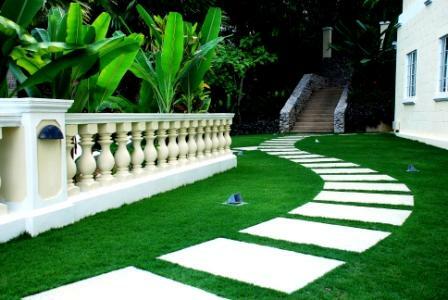 Spatial organization can help you optimize the spaces in your garden, creating a host of dramatic effects which can add exciting dimension to your garden. Look at the following photograph, in which we see this spatial organization technique in use. In this photo, there is an appearance of slightly graduated stepping stones laid against one another to create a magical effect. The larger appearing stones are laid at the forefront of this photo, while stones that appear smaller are laid near the garden bridge. 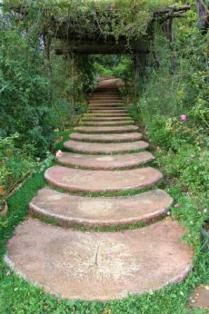 Note that each stone is laid on top of the other, which gradually raises the level of the path up vertically as well. 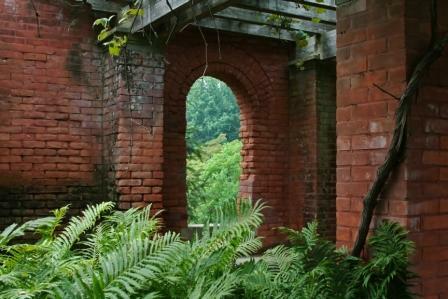 The illusion is that the entire scene is quickly closing in upon itself, which creates a real sense of enclosure as you walk through the garden. Looking at your garden spaces with eyes that see these principles at work can allow you to take advantage of distant vistas, interesting focal points, and optical illusions that create more visual space in your garden. Your imagination rules, because with these spatial organization tricks up your sleeve, you can organize your space in a pleasing manner no matter what size your garden plot.